Remember yesterday’s post of the fish cakes from Simply Recipes? 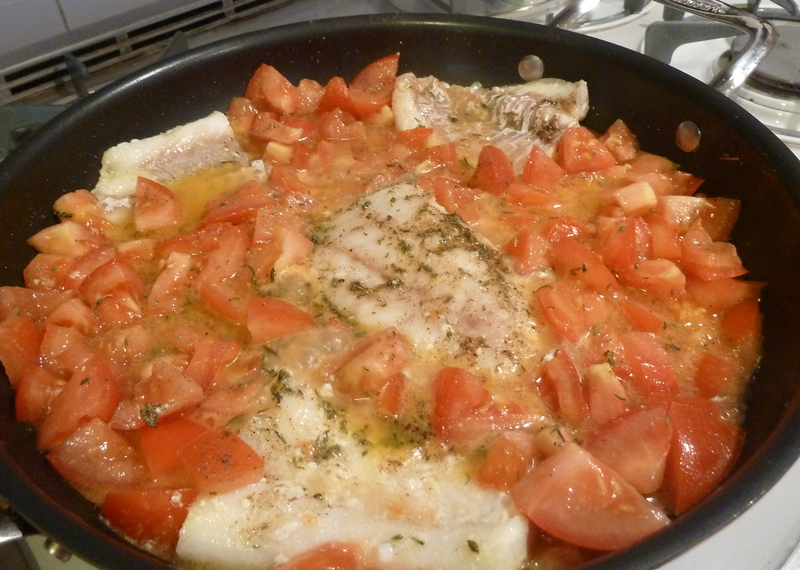 I guess this is a Simply Recipes week because I found another cool looking recipe for cod with fresh tomatoes and couldn’t resist it. This is a very straightforward, quick and easy cod recipe that made an excellent dinner and was liked by everybody in the family. I made only couple of small changes. Definitely a keeper! How to make: Wash and dry the fillets. Cover the bottom of a pan with a thin layer of olive oil. Heat the olive oil and add the fillets. Cook them at medium heat for about a minute and a half. Then spoon hot oil on the top part of the fillets continuously until the fish starts flaking. Add the tomatoes, more salt to taste, the seasonings and the hot element. Cook for another minute or two. Serve the fish first and spoon on top generous amounts of tomatoes and their sauce. Notes and tips: If you use frozen cod, make sure the fish is soft and dry before you cook it. If it still has ice on it when you put it in the pan, it will become watery and will take longer for the tomatoes to cook.